Two sites located between junctions, connected by a pedestrian footbridge. The newest service area on the M5 and in England, operated by Westmorland, owners of the popular Tebay services. They are working with a local charity, the Gloucestershire Gateway Trust, to run the site and ensure it is both environmentally friendly and supportive of the local area. First three hours free for all vehicles, after which cars must pay £12 and caravans and HGVs must pay £23 to include a £5 food voucher. The fees are enforced by Westmorland Limited. The petrol station shows clearly how the artificial hills are designed. During planning, the services were referred to as 'Gloucestershire Gateway', while the Highways Agency preferred 'Brookthorpe'. Regulations require a precise name to be used publicly, so upon opening it became 'Gloucester services'. In 2015, VisitEngland gave the services 5 stars, calling it "fabulous". In Spring 2017, Transport Focus calculated a 99% satisfaction score for the services, making it the third-best in the country. The southbound side gained a Changing Places toilet in 2018, and there is a plan to build a hotel here. The plans were formally approved on Tuesday 10 August 2011, to much local outcry. It was very unpopular with local residents as this is an area of outstanding natural beauty and may have archaeological deposits beneath the proposed site. Despite this, the residents trust for one of the nearby communities in Matson had said that they support the services and think it would benefit the area. There was a judicial review of the plans in January 2012, led by neighbouring operators Welcome Break and Roadchef, who argued the environmental impacts had been underestimated. This appeal was thrown out; Mr Justice Bean backed Stroud District Council's planning approval after a two-day hearing in Birmingham. 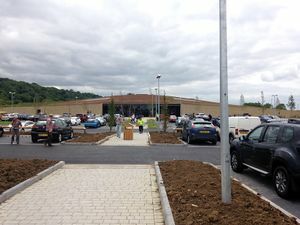 The Highways Agency had previously said that they think the services don't have enough parking spaces, and that the services's aim to specialise in local produce could make it "a destination in its own right", which was against regulations at the time. They later said that they have no problems with the revised plans, but they had given conflicting statements as to whether they agree that there is a need for a new service area or not. It was set to cost around £30million and create 300 jobs, and sought to be one of the most pleasant service stations around. Like Tebay, Westmorland said they will use local produce. 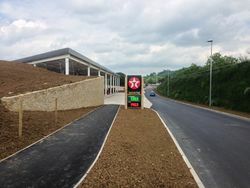 On 15 June 2012, it was announced that the plans for the proposed Gloucester Services project had been delayed for 18 months. Construction began on the northbound site on 3rd March 2013, with the southbound site's construction starting in June 2014, after the northbound site opened. The northbound site opened on 7 May 2014, with the southbound site opening just over a year later, on the 19th May 2015. It was advertised as "a rare breed of motorway service - dedicated to local food, farming and local community". A previous service area was proposed here by Roadchef in 1994 but it was overthrown.